During its long history in China, which spans nearly 20 centuries, Buddhism developed flourishing traditions, exerted far-reaching influence on intellectual and religious life, and left its mark on virtually all aspects of Chinese society and culture. The transmission of Buddhism into China involved the wholesale introduction of (at first) alien complexes of ideas and institutions that opened new horizons of intellectual inquiry and spiritual exploration, thereby enlarging the contours of Chinese civilization and enriching its contents. with Buddhism adding new elements to Chinese civilization while at the same time undergoing dramatic changes in the process of its adaptation to China’s social ethos and cultural milieu. Buddhism first entered China around the beginning of the Common Era, during the Eastern Han dynasty (25-220 C.E.). The first Buddhist missionaries arrived through the empire’s north-western frontier, accompanying merchant caravans that traversed the network of trade routes known as the Silk Road, which linked China with Central Asia and Persia, with additional links to West and South Asia. By that time Buddhism had already establish a strong presence within the Central Asian kingdoms that controlled most of the trade along the Silk Road. That supposedly precipitated the emperor’s sending of a western-bound expedition that brought back to China the first Buddhist text (and 2 missionaries, according to a later version of the story). Taking into consideration the court-oriented outlook of traditional Chinese historiography, such focus on the emperor’s role in the arrival of Buddhism should not come as a surprise. However, in light of the prevalent patterns of economic and cultural interaction between China and the outside world during this period, it seems probable that Buddhism had already entered China prior to Emperor Ming’s reign. Most of the early Buddhist monks who entered China were associated with the Mahāyāna tradition, which was increasing in popularity even while it was still undergoing creative doctrinal development. The foreign missionaries - most of whom were Kushans, Khotanese, Sogdians, and other Central Asians - entered a powerful country with evolved social and political institutions, long-established intellectual and religious traditions, and a profound sense of cultural superiority. The institution of Monasticism, with its stress on ascetic renunciation, which included celibacy and mendicancy, was alien to the Chinese and went against the Confucian-inspired mores adopted by the state and the ruling aristocracy. The principal object of the criticisms was the monastic order (Saṅgha). Buddhist monks were accused of not being filial because their adoption of a celibate lifestyle meant they were unable to produce heirs and thereby secure the continuation of their families’ lineages. while the traditional Buddhist emphasis on independence from the secular authorities was perceived as undermining the traditional authority of the emperor and subverting the established socio-political system. From a doctrinal point of view, Buddhism was perceived as being overly concerned with individual salvation and transcendence of the mundane realm, which went counter to the pragmatic Confucian emphasis on human affairs and socio-political efficacy. Finally, Buddhism met disapproval on account of its foreign origin, which in the eyes of its detractors made it unsuitable for the Chinese. Despite these misgivings, by the fall of the Han dynasty in 220 Buddhism had managed to gain a foothold in China. It was an age of political fragmentation as non-Chinese tribes established empires that ruled the north, while the south was governed by a series of native dynasties. In the eyes of many educated Chinese the collapse of the old imperial order brought discredit to the prevailing Confucian ideology, which created an intellectual vacuum and a renewed sense of openness to new ideas. Buddhism was also attractive to the non-Chinese rulers in the north, who were eager to use its universalistic teachings in their search for political legitimacy. Many upper- class Chinese who were familiar with Daoist texts and teachings were drawn to Buddhism’s sophisticated doctrines, colourful rituals, and vast array of practices, including Meditation. Buddhist teachings and practices bore reassuring (if often superficial) resemblance to those of Daoism, while they also provided original avenues for spiritual growth and inspiring answers to questions about ultimate values. The growth of Buddhism was further enhanced by the adaptability of the Mahāyāna traditions that were imported into China. The favourable reception of Buddhism was greatly aided by its capacity to be responsive to native cultural norms, socio-political demands, and spiritual predilections, while at the same time retaining fidelity to basic religious principles. During the period of division, Buddhism in the north was characterized by close connections between the clergy and the state, and by interest in thaumaturgy, asceticism, devotional practice, and meditation. In contrast, the south saw the emergence of so-called gentry Buddhism. Some southern elites (a group that included refuges from the north) who were interested in metaphysical speculation were especially attracted to the Buddhist doctrine of Śūnyatā (Emptiness), which was often conflated with Daoist ideas about the nature of reality. The southern socio-religious milieu was characterized by close connections between literati-officials and Buddhist monks, many of whom shared the same cultured aristocratic background. Despite 2 anti-Buddhist Persecutions during the 452-466 and 547-578 periods, by the 6th century Buddhism had established strong roots throughout the whole territory of China, and had permeated the societies and cultures of both the northern and the southern dynasties. Moreover, Chinese Buddhism was exported to other parts of East Asia that were coming under China’s cultural influence, above all Korea and Japan. The reunification of the empire under the Sui dynasty (589-618) is often designated as the starting point for the next phase in the evolution of Chinese Buddhism. Throughout the Sui-Tang period, Buddhism was widely accepted and practiced by members of all social classes, from poor peasants to aristocrats and the royal family. A number of Tang emperors offered lavish patronage to Buddhism, although such support was usually accompanied by efforts to control the religion and harness its power and prestige for political ends. By this time, the early rapprochements between Buddhism and the Chinese state evolved into a close relationship between the two. Despite the earlier efforts on the part of monastic leaders to secure a semblance of independence for the monastic community, Buddhism became firmly integrated into the socio-political establishment. With their prayers and rituals the clergy accrued merit and provided supernatural protection for the dynasty and the state. Buddhism also provided the rulers with an additional source of legitimacy, which was used in an especially skilful manner by Empress Wu Zetian (r. 684-705), the only female monarch in Chinese history and one of the greatest patrons of Buddhism. In exchange, the state offered political patronage and financial support to the Buddhist community, and bestowed on the clergy various benefits such as exemption from taxation, corvee labour, and military service. The state also asserted its right to control key aspects of religious life, including bestowal of monastic ordinations, building of monasteries, and entry of new texts into the Buddhist canon. During the Sui-Tang period Buddhism was by far the most powerful and creative religious and intellectual tradition in the empire, eclipsing both Confucianism and Daoism (even though the other 2 traditions also flourished during this period). The main schools of Chinese Buddhism, such as Tiantai, Huayan, and Chan, were also formed during this era, thereby giving rise to uniquely Sinitic systems of Buddhist philosophy and methods of praxis. The emperor ordered destruction of virtually all monasteries in the empire and mass return to lay life of the clergy. The onset of the persecutions was influenced by a number of complex factors, including the influence of the emperor’s Daoist advisers, economic considerations, dismay over monastic corruption, and latent anti-Buddhist sentiments among pro-Confucian officials. Even though the persecution was short-lived and Buddhism quickly rebounded, many scholars see the persecution as a turning point and the beginning of the extremely protracted decline of Buddhism in China. Late imperial China - covering the period from the Song (960-1279) until the end of the Qing dynasty (1644-1911) - can be taken to correspond to a 4th phase in the history of Chinese Buddhism. The history of Buddhism during this era is usually told as a narrative of decline, punctuated with occasional efforts to revive the great tradition’s ancient glories. It is undeniable that under the Song, Buddhism exerted strong influence and attracted a large following among members of all social classes. The religion continued to enjoy state patronage and the monastic vocation attracted many individuals. Buddhist influence on Chinese culture was also pervasive, as can be observed in the literature and visual arts of the period. At the same time, there were signs of creeping decline, especially in terms of intellectual creativity, notwithstanding new developments in Tiantai scholasticism and Chan literature and praxis. The intellectual decline is evident in the lack of compelling Buddhist responses to the serious challenge posed by the Song Confucian revival. The shift of the Chinese elite’s interest away from Buddhism and toward Confucianism was further boosted by the acceptance of neo-Confucianism, as formulated by its great systematiser Zhu Xi (1130-1200), as official state orthodoxy during the 14th century. For the rest of the imperial period Buddhism managed to survive, albeit in diminished capacity and often on the margins. For the most part Buddhism after this point assumed a conservative stance, as there was no emergence of major new traditions or significant paradigm shifts. During the final decades of the imperial era, China’s inability to adequately respond to the challenges of modernity - rudely brought to its doorstep by the increasing encroachment of the colonial powers on Chinese territory in the 19th century - led to erosion and eventually disintegration of its age-old social and political institutions. After the Republican Revolution of 1912, efforts at creating a strong and stable modern state ended in failure. The bleak situation was exacerbated by China’s moribund economy and rampant corruption. During this tumultuous period, the adverse socio-political circumstances affected Buddhist institutions, and traditional beliefs and practices were rejected by many educated Chinese as out-dated superstitions. In some quarters, the revitalization took the form of renewed interest in traditional intellectual and religious activities, such as philosophical reflection on Buddhist doctrines and the practice of Chan meditation. The progressive agenda of the reformers included establishment of educational institutions where the clergy received modern education. In addition, efforts were made to internationalize Chinese Buddhism by establishing connections with Buddhist traditions in other countries. With the Communist victory in the civil war and the establishment of the People’s Republic in 1949, Buddhism had to contend with a governing ideology that had little sympathy for traditional religious beliefs and practices. During the 1950s the new regime was mainly concerned with controlling Buddhism by instituting policies that restricted the activities of the clergy and imposed state supervision over Buddhist organizations. The situation rapidly deteriorated during the 1960s and reached its lowest point with the violent suppression of Buddhism (along with other religions) during the worst excesses of the Cultural Revolution. At the time it seemed that the 20 centuries of Buddhist history in China might be coming to an end. The modest resurgence of Buddhism in China involves restoration of temples and monasteries, ordination of clergy, revival of traditional beliefs and practices, and increased interest in academic study of Buddhism as a part of traditional Chinese culture. 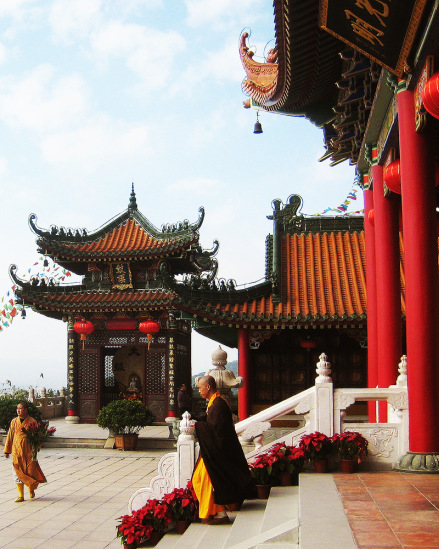 Chinese Buddhism is also thriving in Taiwan, as well as among immigrant Chinese communities throughout Asia and in the West. and because of the lack of bilingual expertise among the foreign missionaries and the native clergy, which was exacerbated by the Chinese aversion to learning foreign languages. During the early period many of the translations were small private undertakings, typically led by a foreign monk who was aided by Chinese assistants. A case in point is the putative method of “matching the meaning”, which involved pairing of key Buddhist terms with Chinese expressions primarily derived from Daoist sources. While this hermeneutical strategy facilitated the wider diffusion of Buddhist texts and ideas among educated Chinese, it was criticized by eminent monks such as Dao’an (312-385) as an obstacle to the proper understanding of Buddhism. Born in Kucha, Kumārajīva arrived in the capital of Chang’an in 401. With the generous support of the court, which facilitated the formation of a translation bureau, Kumārajīva and his assistants produced a large number of readable translations of key Mahāyāna scriptures and other exegetical works. As a testimony to the success of Kumārajīva’s efforts, most of his translations remained the standard versions throughout the history of Buddhism in East Asia. Kumārajīva also taught a number of talented disciples about the fine points of Mahāyāna doctrines, especially the Madhyamaka philosophy of Nāgārjuna (ca. 2nd century C.E.). A number of influential translators followed in Kumārajīva’s footsteps, including Paramārtha (499-569), whose translations of Yogācāra texts served as a catalyst for the huge Chinese interest in the doctrines of this Indian school of Mahāyāna philosophy. After returning from his celebrated Pilgrimage to India, where for many years he studied at the main centres of Buddhist learning, Xuanzang spent the last 2 decades of his life translating the numerous manuscripts he brought back to China. Despite their superior styling and greater philological accuracy, Xuanzang’s translations did not achieve the same widespread acceptance as Kumārajīva’s translations. The Chinese Apocrypha included both popular religious tracts as well as texts that contained sophisticated explorations of doctrinal themes. They often crossed the porous lines separating Buddhism from popular beliefs, and because of that they were sometimes criticized by members of the monastic elite. On the other end of the spectrum, there were apocryphal texts dealing with doctrinal issues, which exemplified Chinese appropriations of Mahāyāna teachings that resonated with native intellectual concerns and ways of thinking. Even though the problematic provenance of these texts was frequently noted by medieval Buddhist cataloguers, a good number of them achieved wide acclaim and became part of the Canon. These texts are written in a number of genres and cover a wide range of perspectives on diverse aspects of Buddhist beliefs, doctrines, practices, and institutions. texts dealing with monastic regulations and practices, meditation and ritual manuals, historical works, and systematic expositions of Sinitic doctrinal systems (such as Huayan and Tiantai). An example of that type are the Chan school’s records of sayings (yulu) and Gong’an (Japanese, Kōan) collections. In addition, there are a large number of extra-canonical works - such as collections of miracle tales - that deal with popular Buddhist beliefs and practices. Buddhist themes and ideas can also be found in secular literary works, such as the poems of major Chinese poets, including Wang Wei (701-761) and Bo Juyi (772-846) during the Tang, and Su Shi (1037-1101) during the Song period. - a religious group bound together by shared ideals and adherence to a common set of principles. They primarily represented distinct doctrinal or exegetical orientations, or loosely-organized religious groups that were subsumed within the mainstream monastic order. It is also important to note that as a rule these schools involved only a small segment of the monastic elite, and local manifestations of Buddhist religiosity among ordinary people mostly had little direct connection with them. During the 4-5th centuries the most influential school of Mahāyāna was the Madhyamaka (Middle Way), whose teachings of Śūnyatā attracted the attention of Chinese scholiasts. The interest in Madhyamaka philosophy was stimulated by the arrival of Kumārajīva, and it culminated with the formation of the Sanlun (Three Treatises) school by Jizang (549-623), which is usually described as a Chinese version of Madhyamaka. toward increased interest in teachings that presented more positive depictions of the nature of reality and the quest for salvation, especially as articulated by the Yogācāra and Tathāgata-garbha traditions. eventually led to the development of the Shelun school (based on the Mahāyāna-saṁgraha of Asaṅga) and the Dilun school (based on Vasubandhu’s commentary on the Daśa-bhūmika-sūtro-padeṣa). Both of them were primarily exegetical traditions, centred around small groups of elite scholarly monks who were bound by shared religious and intellectual interests. Although these theories did not give rise to any new Chinese schools, they became key doctrinal tenets and articles of belief for the new Buddhist traditions that emerged during the Sui-Tang period. Each of them was a unique Sinitic tradition that had no direct counterpart in Indian Buddhism, and their emergence is viewed as the culmination of the Sinification of Buddhist doctrines and practices. Tiantai and Huayan were especially renowned for their scriptural exegesis and creation of sophisticated systems of Buddhist doctrine that represent the highest intellectual achievements of Chinese Buddhism. - while the Pure Land tradition emphasized faith and devotional practices. Chan and Pure Land came to dominate the religious landscape of Chinese Buddhism from the late Tang onward, with Chan being more popular among the monastic elites and their educated followers, and Pure Land enjoying a greater following among the masses. The history of Chinese religions is usually discussed in terms of the “3 teachings”: Confucianism, Daoism, and Buddhism. China’s religious history during the last 2 millennia was to a large extent shaped by the complex patterns of interaction among these 3 main traditions and popular religion. The history of Buddhism in China was significantly influenced by its contacts with the indigenous traditions, which were also profoundly transformed through their encounter with Buddhism. During the early period the acceptance of Buddhism was helped by the putative similarities between its beliefs and practices and those of Daoism. In the literary arena, that included large-scale adoption of Buddhist terminology and style of writing. The Daoist canon itself was modelled on the Buddhist canon, following the same 3-fold division. In addition, numerous Buddhist ideas - about merit, ethical conduct, salvation, compassion, rebirth, retribution, and the like - were absorbed into Daoism. The Buddhist influence also extended into the institutions of the Daoist church, and Daoist monasteries and temples were to a large extent modelled on their Buddhist counterparts. The prevalent view was that the 3 traditions were complimentary rather than antithetical. Buddhism and Daoism were primarily concerned with the spiritual world and centred on the private sphere, whereas Confucianism was responsible for the social realm and focused on managing the affairs of the state. there were occasional debates with Daoists that were in part motivated by the on-going competition for official patronage waged by the 2 religions. More conspicuous expressions of exclusivist sentiments came with the emergence of neo-Confucianism during the Song period. The stance of leading Confucian thinkers toward Buddhism was often marked by open hostility. As they were trying to recapture intellectual space that for centuries had been dominated by the Buddhists, the leaders of the Song Confucian revival remade their tradition in large part by their creative responses to the encounter with Buddhism. Buddhist teachings about Karma (Action) and Rebirth, beliefs about other realms of existence, and basic ethical principles became part and parcel of popular religion. In addition, Buddhist deities - such as Guan-Yin, the Bodhisattva of compassion - were appropriated by popular religion as objects of cultic worship. The influence went both ways, as popular deities were worshiped in Buddhist monasteries and Buddhist monks performed rituals that catered to common beliefs and customs, such as worship of Ancestors.